Brilliant white diamonds and an alluring paisley pattern come together for a fashionable wedding band from Apples of Gold. The 14K white gold band measures 4mm wide and features a total of 0.23 carats of white diamonds set in the center of the band. These sparkling stones are bordered by two smoothly polished edges on either side. 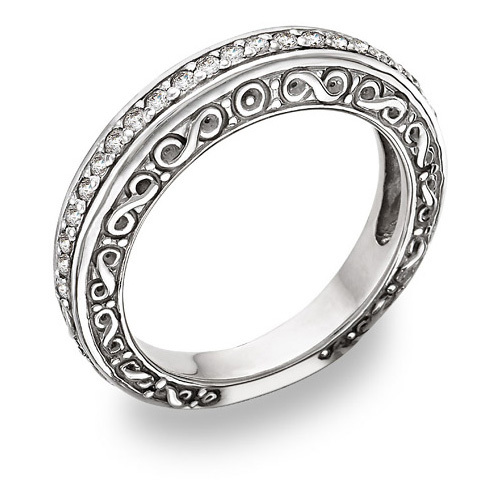 The band also features delicately carved paisley shapes that almost encompass the ring. This paisley and diamond wedding ring is the perfect choice for a traditional diamond look with a fashion-forward feel. We guarantee our 1/4 Carat Diamond Paisley Wedding Band to be high quality, authentic jewelry, as described above.